One hundred years after the death of Sir Alfred Russel Wallace, an international team of zoologists has discovered a new genus of mammal in the Halmahera Island in Indonesia. It is located in Wallacea, an Eastern Indonesian region named after the British Naturalist himself. The team was surprised to find the new endemic rodent close to the locality of Boki Mekot, a mountainous area under severe ecological threat due to mining and deforestation. Drawing: Jon Fjelså Download free press photo. 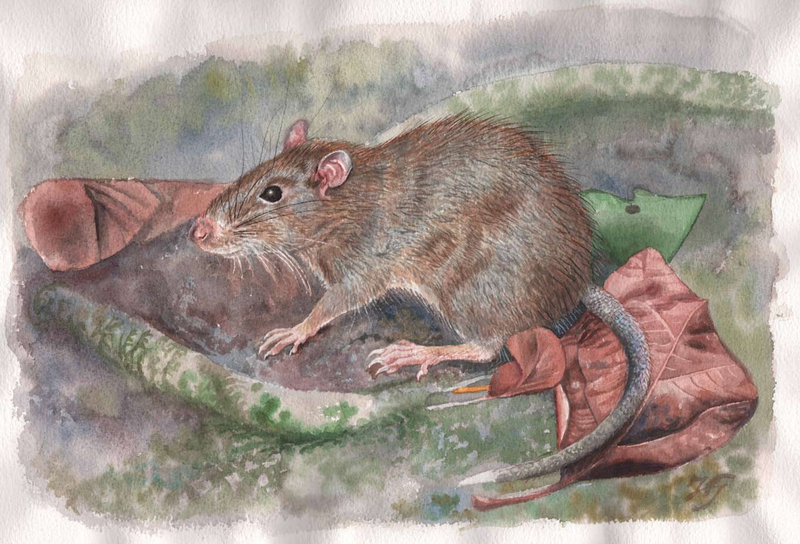 Halmaheramys bokimekot is a terrestrial spiny rat of medium body size with brownish grey fur on its back and a greyish white belly. Together with its other characteristics it represents a unique set of features that has never been reported before in the Moluccas. 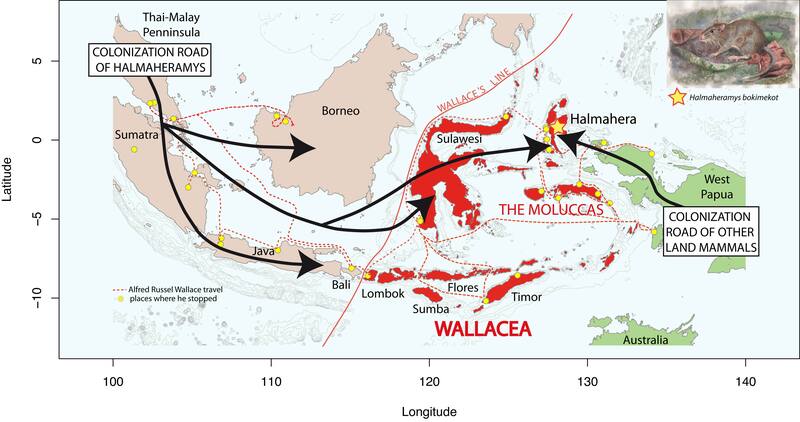 It is clear that the region had a profound influence of Wallace’s thinking as it was from the Moluccan province of Indonesia that Wallace wrote his famous letter about natural selection and evolutionary theory to Charles Darwin. The two naturalists both published their findings in 1858. The unique nature of the plants and animals found within the region and the large floral and faunal differences to the neighboring region of Australia, later inspired Wallace to define a zoogeographical boundary dividing the Indonesian archipelago into two distinct parts: a western portion in which the animals are largely of Asian origin and an eastern portion where the fauna reflect Australasia. This is known as the Wallace line. “The Halmaheramys discovery supports Wallace’s idea of an important faunal breakup in this region. Most of the species on the island of Halmahera reflect eastern origins, but our genetic analysis revealed a western origin of the new rat genus. That reflects the unique transition zone found in the Indo-Pacific, and warrants much greater scientific investigation,” says Pierre-Henri Fabre. Photo: Pierre-Henri Fabre. The picture represents the colonisation road of native rat lineages in the Wallacean region. The map also illustrates the Indo-Malay travel of AR Wallace. Download free press photo. Last year he and colleagues from the Center for Macroecology, Evolution and Climate provided an update of Wallace’s zoogeographical world map from 1876 based on modern technology such as DNA analysis and hundreds of thousands of species records. The study showed that in spite of lacking modern techniques Wallace’s zoogeographical boundaries of the world were remarkably accurately. “Such a remarkable island setting inspired one of the greatest biologists of all time, and if Sir Alfred Russell Wallace were alive today he would surely be excited by the prospect of further conservation and biodiversity study within the Moluccas,” says Pierre-Henri Fabre. Fabre P.-H.*, Pagès M., Musser G.G., Fitriana Y.S., Fjeldså J., Jennings A., Jønsson K.A., Kennedy J., Michaux J., Semiadi G., Supriatna N., & Helgen K. (early view) A new genus of rodent from the Wallacea (Rodentia: Muridae: Murinae: Rattini) and its implication for biogeography and Indo-Pacific Rattini systematics. Zoological Journal of the Linnean Society, Vol.169(2).